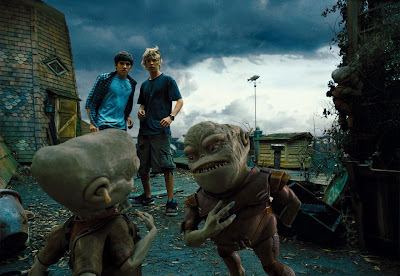 It should be an ordinary Holiday for the Pearson Family when Tom (Carter Jenkins) and Jake (Austin Butler) found out that their vacation house attic is invaded by extraterrestrial beings who wants to rule the world. Forced to battle the invaders, the two cousins regrouped with their other cousins to formulate battle plans to beat the aliens while the grown ups stays clueless without knowing anything about the war that's happening in the attic. As the battle continues, the kids met and became allied to somebody that they didn't expect that reveals the real plans of the invaders. 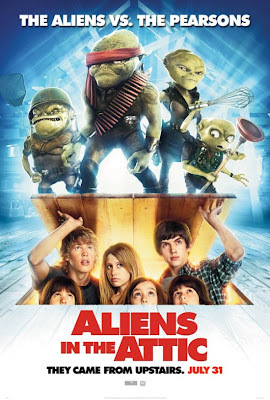 So will the kids prevail or the Aliens will be the victor of this silent war? Story wise Aliens in the attic is not original. Generic Alien invasion plot line that is used in countless movies in Hollywood. Even the social aspect of the plot don't even have sense. A geek who pretends to be dumb is senseless and not to mention pointless. On the other hand, Ashley Tisdale and Robert Hoffman's characters provided most of the humor factor of the film which makes this film enjoyable despite the weak plot. The character designs lacks impact and they don't have lasting impression specially to kids. The movie is not popular and I'm not even aware of this movie coming when I saw the trailer while watching Disney Pixar UP. And maybe that is the reason why nobody even tried talking about it. To sum it up. 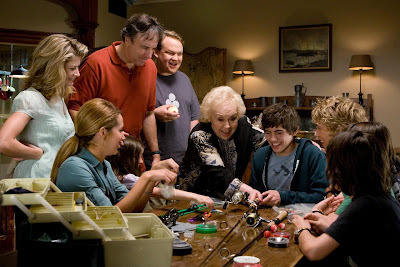 Aliens in the Attic is Funny, thanks to Robert Hoffman and the Kung Fu fighting Grandama, Doris Roberts. But I hate to say this, the movie doesn't deserve your money. When it comes in DVD, rent it but don't bother spending for it on cinemas because there are more movies who deserves your precious time and money. But if you really want to watch it, the movie is already showing in all cinemas nationwide.